Before every WBC for the last many years, I've constructed a driver ranking. Originally I did this on the sly just so I could seed qualifying fields on the fly and the event. Now its a big publicized thing I put on the web. Next year it might well have some role in official organized play for CFR. 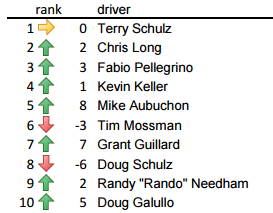 Quick top 10 view on the right, full driver rankings and explanation and history on the CFR pages. 1) Each race that a driver participates in generates them some number of points if they finished 9th or better. Those points are then increased or decreased based on the level of competition in that race. So a win against better / more drivers is worth more points. A driver's top 4 races based on points is the largest bit of a driver's ranking score. 4 race wins against average competition would be worth 92 points. 9 different drivers did better than that. 2) Each driver's final finish in an event or tournament grants them points if they finished in the top 9 drivers in that event. Effectively events are scored exactly like individual races. But we only count the top 2 event scores. The fact that events are now adjusted based on the competition (of the top 12 participants) is new this year. 3 and 4 should be pretty self explanatory now. * Terry Schulz (ie. my dad) is still #1 but has been sitting on his laurels and will likely drop precipitously next year when his great WBC run of 2012 falls off the rankings. * Biggest rise in the rankings was Tim Baker who moved up 43 spots from 69th to 26th. * Biggest rise in the top 10 was last year's WBC champ Mike Aubuchon who rose from 13th to 5th. * Chris Long missed out on the top spot this ranking by less than 1 point. * Will Kenard leads everyone in races with 42... 10 more than the next guy.